On ROS Melodic you do not need to build MoveIt! from source, but for older versions of MoveIt! you do (see previous tutorial versions). To use CHOMP with your robot you must already have a MoveIt! configuration package for your robot already. For example, if you have a Panda robot, it’s called panda_moveit_config. This is typically configured using the MoveIt! Setup Assistant. Note: if you are following this demo using the panda_moveit_config from the ros-planning/panda_moveit_config repository, these steps are already done for you and you can skip this section. Simply download chomp_planning_pipeline.launch.xml file into the launch directory of your MoveIt! config package. In our case, we will save this file in the panda_moveit_config/launch directory. Adjust the line <rosparam command="load" file="$(find panda_moveit_config)/config/chomp_planning.yaml" /> to <rosparam command="load" file="$(find <robot_moveit_config>)/config/chomp_planning.yaml" /> replacing <robot_moveit_config> with the name of your MoveIt! configuration package. Download chomp_planning.yaml file into the config directory of your MoveIt! config package. In our case, we will save this file in the panda_moveit_config/config directory. Open chomp_planning.yaml in your favorite editor and change animate_endeffector_segment: "panda_rightfinger" to the appropriate link for your robot. Copy the demo.launch file to demo_chomp.launch. Note that this file is also in the launch directory of your MoveIt! config package. In our case, the panda_moveit_config/launch directory. Open the move_group.launch file in your <robot_moveit_config>/launch/ folder and make two changes. Second, within the <include ns="move_group"> tag replace <arg name="pipeline" value="ompl" /> with <arg name="pipeline" value="$(arg planner)" />. This script creates a cluttered scene with four obstacles or a simple scene with one obstacle depending on the argument given to the script. One can also change the position/size of the obstacles to change the scene. Next, in RViz, select CHOMP in the MotionPlanning pannel under the Context tab. Set the desired start and goal states by moving the end-effector around with the imarker and then click on the Plan button under the Planning tab in the MotionPlanning pannel to start planning. The planner will now attempt to find a feasible solution between the given start and end position. max_iterations_after_collision_free: maximum iterations to be performed after a collision-free path is found. learning_rate: this is the learning rate used by the optimizer to find the local / global minima while reducing the total cost. smoothness_cost_velocity, smoothness_cost_acceleration, smoothness_cost_jerk: variables associated with the cost in velocity, acceleration and jerk. ridge_factor: the noise added to the diagonal of the total quadratic cost matrix in the objective function. Addition of small noise (e.g., 0.001) allows CHOMP to avoid obstacles at the cost of smoothness in trajectory. use_pseudo_inverse: enable pseudo inverse calculations or not. pseudo_inverse_ridge_factor: set the ridge factor if pseudo inverse is enabled. collision_clearance: the minimum distance that needs to be maintained to avoid obstacles. use_stochastic_descent: set this to true/false if you want to use stochastic descent while optimizing the cost. In stochastic descent, a random point from the trajectory is used, rather than all the trajectory points. This is faster and guaranteed to converge, but it may take more iterations in the worst case. enable failure recovery: if this is set to true, CHOMP tweaks ceratin parameters in the hope to find a solution when one does not exist with the default paramters specified in the chomp_planning.yaml file. max_recovery_attempts: this is the maximum times that CHOMP is run with a varied set of parameters after the first attempt with the default parameters. trajectory_initializaiton_method: the type of initialization of the trajectory can be supplied here for CHOMP, this can be quintic-spline, linear, cubic or fillTrajectory. The first three options refer to the interpolation methods used for trajectory initialization between start and goal states. fillTrajectory provides an option of initializing the trajectory from path computed from an existing motion planner like OMPL. Choosing parameters for CHOMP requires some intuition that is informed by the planning environment. For instance, the default parameters for CHOMP work well in environments without obstacles; however, in environments with many obstacles the default parameters will likely cause CHOMP to get stuck in local minima. 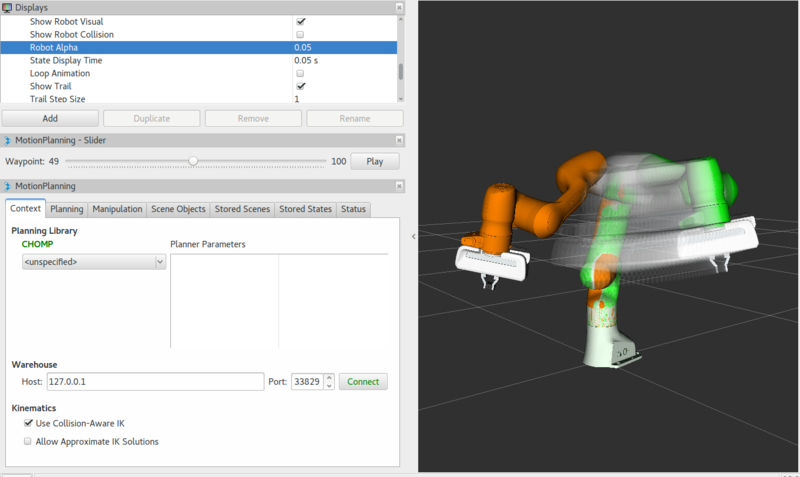 By tweaking parameters, we can improve the quality of plans generated by CHOMP. Some of the unused/commented parameters are hmc_stochasticity, hmc_annealing_factor, hmc_discretization, use_hamiltonian_montecarlo, animate_endeffector, animate_endeffector_segment, animate_path, random_jump_amount, add_randomness. Optimizing planners optimize a cost function that may sometimes lead to surprising results: moving through a thin obstacle might be lower cost than a long, winding trajectory that avoids all collisions. In this section we make a distinction between paths obtained from CHOMP and contrast it to those obtained from OMPL. OMPL is a open source library for sampling based / randomized motion planning algorithms. Sampling based algorithms are probabilistically complete: a solution would be eventually found if one exists, however non-existence of a solution cannot be reported. These algorithms are efficient and usually find a solution quickly. OMPL does not contain any code related to collision checking or visualization as the designers of OMPL did not want to tie it to a any particular collision checker or visualization front end. The library is designed so it can be easily integrated into systems that provide the additional components. MoveIt! integrates directly with OMPL and uses the motion planners from OMPL as its default set of planners. The planners in OMPL are abstract; i.e. OMPL has no concept of a robot. Instead, MoveIt! configures OMPL and provides the back-end for OMPL to work with problems in Robotics. CHOMP: While most high-dimensional motion planners separate trajectory generation into distinct planning and optimization stages, CHOMP capitalizes on covariant gradient and functional gradient approaches to the optimization stage to design a motion planning algorithm based entirely on trajectory optimization. Given an infeasible naive trajectory, CHOMP reacts to the surrounding environment to quickly pull the trajectory out of collision while simultaneously optimizing dynamical quantities such as joint velocities and accelerations. It rapidly converges to a smooth collision-free trajectory that can be executed efficiently on the robot. A covariant update rule ensures that CHOMP quickly converges to a locally optimal trajectory. For scenes containing obstacles, CHOMP often generates paths which do not prefer smooth trajectories by addition of some noise (ridge_factor) in the cost function for the dynamical quantities of the robot (like acceleration, velocity). CHOMP is able to avoid obstacles in most cases but it can fail if it gets stuck in the local minima due to a bad initial guess for the trajectory. OMPL can be used to generate collision-free seed trajectories for CHOMP to mitigate this issue. The order of the planning_adapters is the order in which the mentioned adapters are called / invoked. Inside the CHOMP adapter, a call to OMPL is made before invoking the CHOMP optimization solver, so CHOMP takes the initial path computed by OMPL as the starting point to further optimize it. These additions will add a CHOMP Optimization adapter and load the corresponding CHOMP planner’s parameters. To do this with your own robot replace panda_moveit_config to <my_robot>_moveit_config of your robot. In the move_group.launch file of <robot_moveit_config>/launch folder for your robot, make sure that the default planner is ompl. This will launch RViz, select OMPL in the Motion Planning panel under the Context tab. Set the desired start and goal states by moving the end-effector around in the same way as was done for CHOMP above. Finally click on the Plan button to start planning. The planner will now first run OMPL, then run CHOMP on OMPL’s output to produce an optimized path.